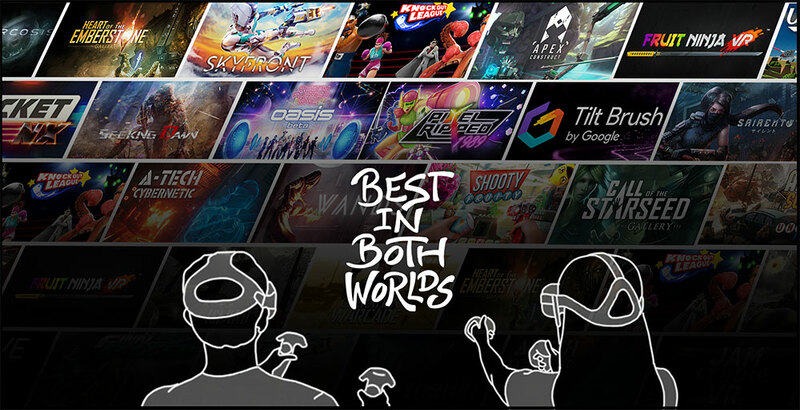 As of today we are proud to support Oculus Rift compatible titles on Viveport, and as part of Viveport Subscription. If you want to get started with Viveport on Oculus Rift, read our blog on how to set things up. Then when you’re ready to play, experience the best value in VR by signing up for Viveport Subscription. With a free 14-day trial available, there’s nothing to lose. You could be playing 5 of the titles below on your Oculus Rift today – completely free. Here are some great picks for Viveport Subscription that run on Oculus Rift. Zero-G arenas, multiplayer battles, an arsenal of weapons and multiple modes of play. While Skyfront VR may officially be in Early Access, it’s already ticking all the right boxes for an original and exciting title that’s truly made to be experienced in VR. If you’re of – ahem – a certain vintage like myself then Pixel Ripped 1989 is almost as powerful as pure nostalgia trip as it is VR game. As well as immersive VR environments that’ll put you right back in your high school classroom, you’ll be playing a game-within-a-game straight out of the Game Boy era, with a unique VR twist. An exhilarating sci-fi spectacle which transports you to a lonely, desolate world, casting you as the last surviving human caught in a conflict between warring AIs. With fluid combat, intriguing puzzles and a central mystery to solve, this is an action-adventure that’s built for VR, and certainly shows it. Cloudhead Games’ epic adventures have been perennial go-to-titles for those wanting to experience the wonder of VR, and to see the potential that still exists to truly create a unique experience. If for some reason you’ve missed out on playing The Gallery then both Episode 1 and 2 are now available in Viveport Subscription. Don’t miss out! What’s better than slashing up virtual fruit with your index fingers? Slashing them up with your whole arm, of course. Evolve from earlier, lesser versions of Fruit Ninja and get into the swing of things with Fruit Ninja VR, which naturally takes the entire slicing-and-dicing thing to the next level. Are you more of a shooter than a slicer? Check out Shooty Fruity – also in Viveport Subscription – which makes you pack groceries in-between mowing down mangoes. There are no shortage of VR games in which you’re asked to punch things (as always, just watch out for those walls in your play space) but how many of them have you punching an octopus? Okay, but how many of them have monocles? Knockout League is both a great arcade boxing experience but also a throwback to when men were men, videogames were videogames, and boxing octopi in top hats were – you get the idea. Similar to boxing, we’ve seen plenty of racket-waving in VR, but not too many games get it quite as ‘right’ as Virtual Sports, which translates table tennis (AKA ping pong) and actual tennis into pixel perfect recreations of the real thing, without the tedious real world hassle of having to pick up missed balls all the time. With some AI opponents that start out ‘Awww’ and end up ‘AAAGH’ there’s plenty of challenge here, too. Remember, you can experience any 5 titles every month as part of your Viveport Subscription. That’s up to 60 different titles a year! Viveport Subscription pre-paid bundles are also on sale now for even better value.